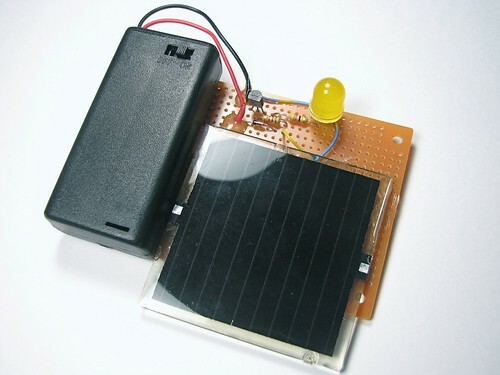 How to get started adding solar power to your small electronics projects. Use the sun to power small solar and battery powered night lights, garden lights, and decorations for halloween. 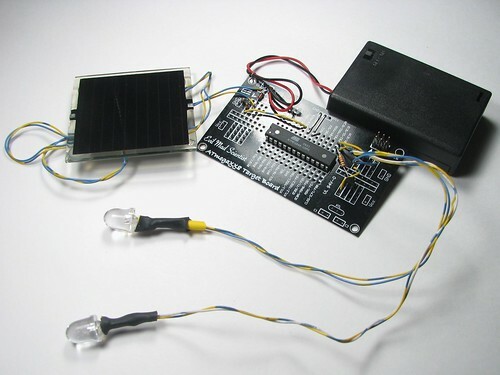 The first part of a solar circuit is… a device for collecting sunlight. To keep things simple, we’re using a single nicely made small solar panel for all of these circuits. The panel that we’re using for these circuits is this one, part number PWR1241 from BG Micro, about $3 each. 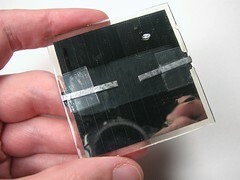 This is a monolithic copper indium diselenide solar panel, apparently printed on a 60mm square of glass and epoxy coated for toughness. On the back of the panel are two (thin) solderable terminals, with marked polarity. (While you can solder directly to the terminals, be sure to stress-relieve the connections, e.g., with a blob of epoxy over your wires.) 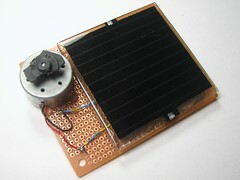 In full sunlight the panel is specified to produce 4.5 V at up to 90 mA, although 50 mA seems like a more typical figure. 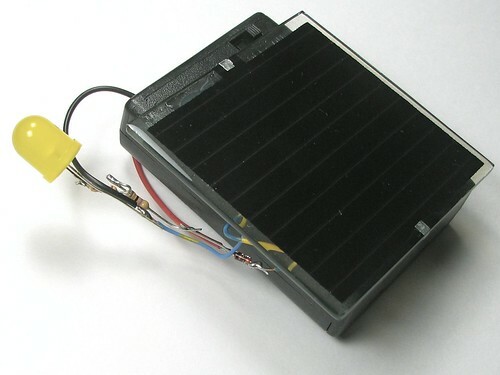 The most obvious way to use power from a solar panel is to connect your load directly to the output leads of the solar panel. Instead of adding a single supercapacitor, you might notice that we’ve actually added two. That’s because the supercaps that we had on hand are rated for 2.75 V– not enough to handle the 4.5 V output of the panel when sunlight is present. To get around this limitation, we used two of the caps in series, for which the voltage ratings add, giving us a barely-okay total rating of 5.5 V. (Note: be careful adding capacitors of different values in series– the voltage ratings may scale in non-obvious ways.) When first exposed to the light, this circuit takes about 30 s to 1 minute to charge the capacitors enough that the LED can turn on. After it’s fully charged, the circuit can be removed from the sunlight and still drive the blue LED for about 30 s to 1 minute– a very effective flywheel for light duty applications. 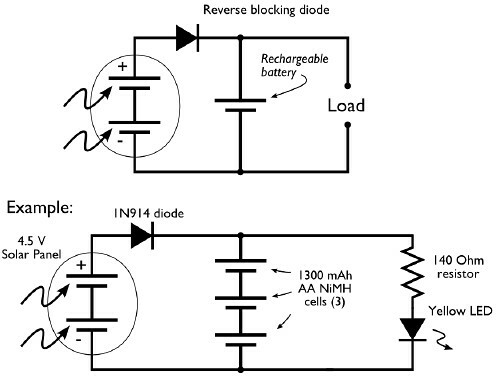 While interruption resistance is nice, a capacitor generally does not provide sufficient energy storage to power a solar circuit for extended periods of time in the dark. A rechargeable battery can of course provide that function, and also provides a fairly consistent output voltage that a capacitor cannot. In this next circuit, we use the solar panel to charge up a NiMH rechargeable battery and also LED off of the power, which will stay on when it gets dark out. In this design we are continuously “trickle charging” up the battery when sunlight is present. For NiMH batteries and sealed lead-acid batteries (the two types that are most suitable for this sort of un-monitored circuit) it is generally safe to “trickle” charge them by feeding them current at a rate below something called “C/10”. For our 1300 mAh battery cells, C/10 is 130 mA, so we should keep our charging below 130 mA; not a problem since our solar panels only source up to 90 mA. The other thing to notice about this circuit is that it’s pretty darned inefficient. The LED is on all the time, whenever the battery is at least slightly charged up. 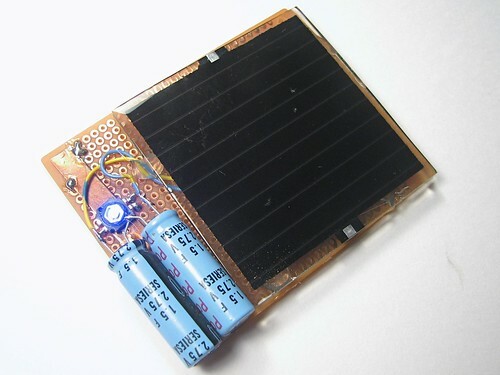 That means that even while the circuit is in bright sunlight it is wasting energy by running the LED: a sizable portion of the solar panel current goes to driving the LED, not to charging the battery. 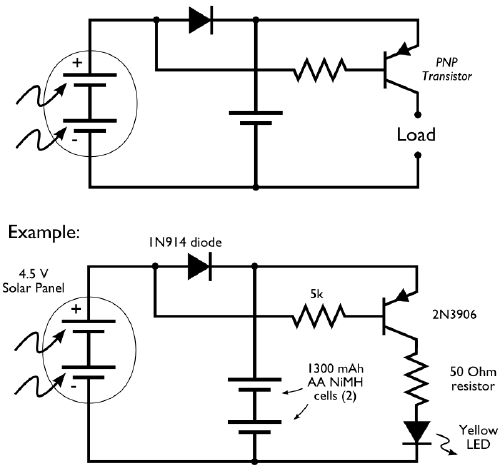 We have written recently about how to make a useful dark-detecting LED driver circuit. That circuit used an infrared phototransistor. To add a darkness detecting capability to our solar circuit is even easier, actually, because our solar panel can directly serve as a sensor to tell when it’s dark outside. To perform the switching, we use a PNP transistor that is controlled by the voltage output from the solar panel. When it’s sunny, the output of the panel is high, which turns off the transistor, but when it gets dark, the transistor lets current flow to our yellow LED. 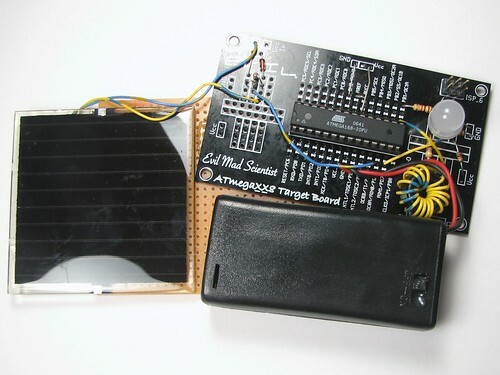 This circuit works very well and is a joy to use– it would make a good upgrade to the dark detecting pumpkin to make it go solar with this circuit. While the last circuit works well for driving a yellow or red LED, it runs at 2.4 V (the output of the NiMH battery), it does not have sufficient voltage to drive a blue or white output LED. So, we can add to that circuit the simple Joule Thief voltage booster to get a good design for a solar garden light: A solar-charged battery with a dark detector that drives a Joule Thief to run a white output LED. Naturally, you’d want to give this a tough, weatherproof enclosure if it were going to be run outside. (A mason jar comes to mind!) This circuit is actually very close to how many solar garden lights work, although there are many different circuits that they use. 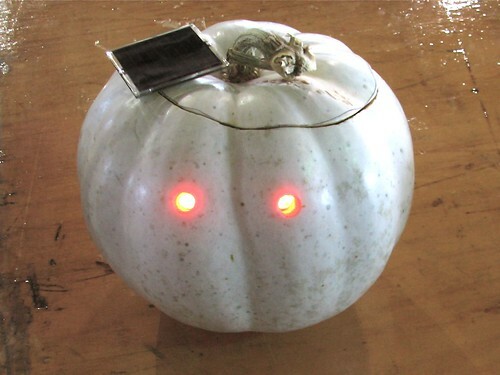 To finish it up, we carved a beautiful white pumpkin and added this circuit to make our microcontroller-driven, dark-detecting, solar-powered programmable pumpkin, which faded its eyes in and out one at a time. Note the long leads on the solar panel and wires to the LEDs to reach. We hope that you might find this introduction to simple solar circuits helpful; let’s see those solar jack-o-lanterns! This entry was posted in Basics, Electronics, EMSL Projects, Engineering and tagged circuits, diy, Halloween. Bookmark the Permalink. I’m having a problem figuring out how to rig one of these up to charge 4AA’s that are connected to 8 Amber LED’s and have a dusk to dawn circuit. I have 2 panels that are 4.5 volts +/-, 8 – 3.2 volt-20ma Amber LED’s, but no charging circuit. I think it’s best in the long run to have a full charging circuit for this project. Do you think I am correct? I also don’t have a properly configured dusk to dawn circuit. Any idea’s? Any help would be great. Thanks. 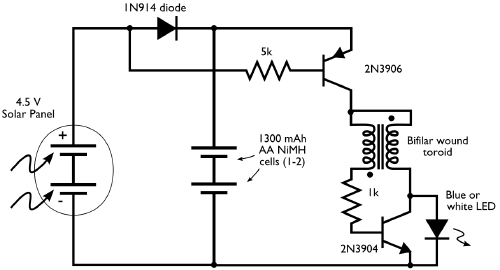 I have a question about "A solar garden light circuit". 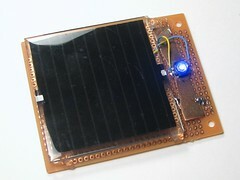 My solar panel generates 7V , 1.4 watt. I have two Ni-MH batteries, and I want to power 3 (not 1) white LED’s. What should I change in that circuit? ps. I am talking about circuit without micro-controller. I have been looking for a very long time now to make somehthing similar, but with a smal fan attached. What I want to make is a ventilator that blows day and night. It will be one that either consumes 2V/40 mA or a larger one that consumes 3,5-4V and 90 mA. It would be okey if it turns on and of lsome of those gardenlamps at night in order to use less energy from the batteries. So the fan needs to run 24h (it is for a thermometer screen). Hi, thanks for the awesome resourceful article. Maybe you can help me… I’m wanting to create a set of solar panels that will directly charge a cell phone (not panels to battery to cell phone). I’ve bought 10 1v 200ma panels and wired them in series and parallel to produce what I thought would be 5v @ 400ma. I also used a diode from the panels but nothing else. However, when I connect them to my cell phones via female usb (both a Galaxy Nexus and Iphone 4s), the phones indicate that they’re charging but don’t charge. The phones both eventually lost power. On my Nexus, I have a current app that tells me it’s discharging at -100ma while the battery icon shows that it’s charging. I also turned the phones completely off and tried to charge, but they both still indicate charging but actually lose charge when powered back on. The short circuit current of my panels setup is showing up to 300ma. With a multimeter hooked up while under load of my phone with mid-day sun in Texas, the meter shows that the current is rapidly changing in the 20-40ma range, which is nothing close to the 400 I was hoping for. Why would this be? Could the phone be losing charge because the panels aren’t putting out enough or a steady enough current? I’m sure my diode is in the correct position so I still don’t understand why they’re losing power. Do I need a capacitor to steady the current out? Cell phones usually need a fairly precise power source. You might consider adding an intermediate battery or voltage regulator, to make sure that you can provide a steady 5 V, or whatever your phones actually require. Is there any chance of you posting the code used in your final circuit? While I’ve written a few small blinken lights programs, I don’t have any experience using the ADC, PWM outputs, or interrupts. At best I’ve just manually altered duty cycles on regular outputs to fade LEDs. Examples of this in action would be excellent. 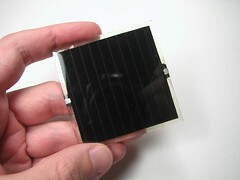 I am looking at using solar cells and batteries to power some accent lighting in my living room. Specifically a couple of 5W LEDs. I’d like to be able to leave them on for a few hours and also be able to toggle them on and off. Any suggestions? This article looked like a good start, but I am not sure if all of the ideas will work when I ramp up the solar panel size to ~15V and also ramp up the battery size.